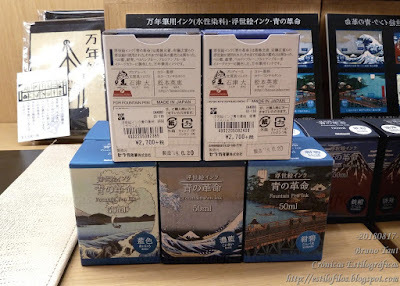 On July 25th I wrote about a new line of inks by Sailor commissioned by Nakabayashi, a stationery company. As is often the case with Chronicles on new inks, I expected a big impact resulting in an increase in visits and a number of links point out at these pages. But that was not the case at all. In fact, the news on these new inks on English-speaking fora barely raised any brow. This is a sharp contrast with the passionate reactions new inks, particularly by Sailor provoked not so long ago. The "Blue Revolution" did not mobilize the masses. Maybe the reasons are completely different. Maybe the colors of the “Blue Revolution” were not attractive. Maybe 50 ml inkwells were too big… All this is, so far, mere speculation, but I also think that the ink market has grown into a bubble of colors and prices. And we might be seeing some signs of change. Bruno, thanks as always for sharing information on new inks coming out of Japan. I imagine most people don't mind the size of the ink bottle as long as it makes sense for the price. Truly, I think the Nakabayashi inks just aren't very interesting—blue inks that look slightly different depending on the size of the nib are already readily available from more accessible retailers. The packaging is beautiful, but I don't think that's reason enough for most people. Thanks, Pharaonis, for your comment. BTW, is your blog "Winter Sharks" active? And now Lamy has joined in with ten new shades. Not sure about the bottle though, doesn't look as useful as the normal 30ml Lamy bottle. Thanks, Saltire, for the information. The ink market is very profitable and it is only logical that more companies wanted to cash their well known and well used knowledge. But is the market willing to take that much offer of new inks and colors? Lamy did not seem that active in the ink market. The exception was the yearly color associated to the yearly edition of a Safari and of an AL star pens. Thanks, Dezorz, for your comment. Now, I do not know if this new apathy in the ink market is a good thing... Is this the invisible hand of Capitalism?